Boeing 707-138 VH-EBC City of Canberra about to depart from Sydney on 29 July 1959 on the inaugural Qantas 707 service, Flight Number EM774-001 to Nadi, Honolulu and San Francisco. 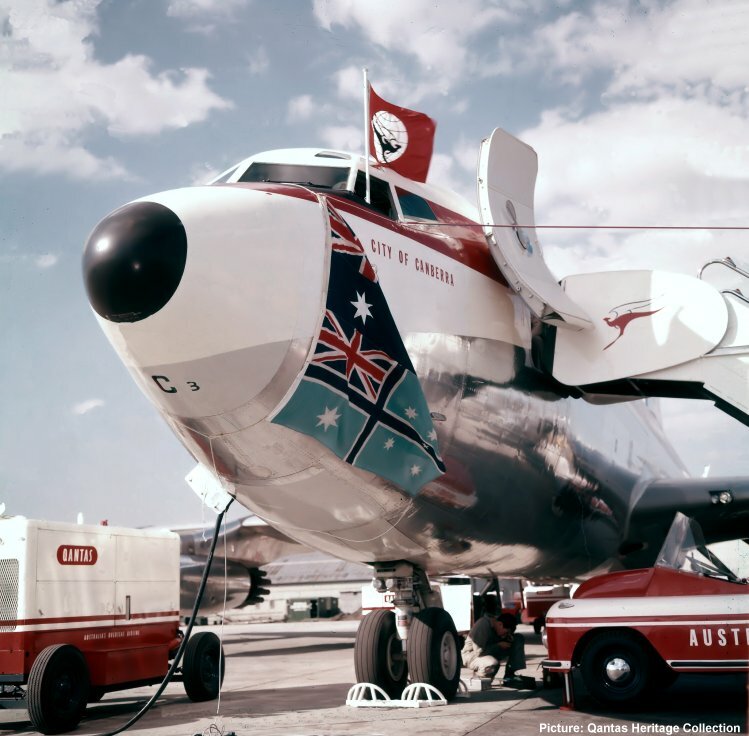 In his book Wings to the World, Sir Hudson Fysh mentions that the aircraft was christened with the cutting of a ribbon by Mrs Paltridge, wife of the Minister for Civil Aviation, Senator Shane Paltridge. Note the markings under the radome, "C" being the last letter of the registration VH-EBC and the "3" indicating that it is the 3rd 707 in the fleet.